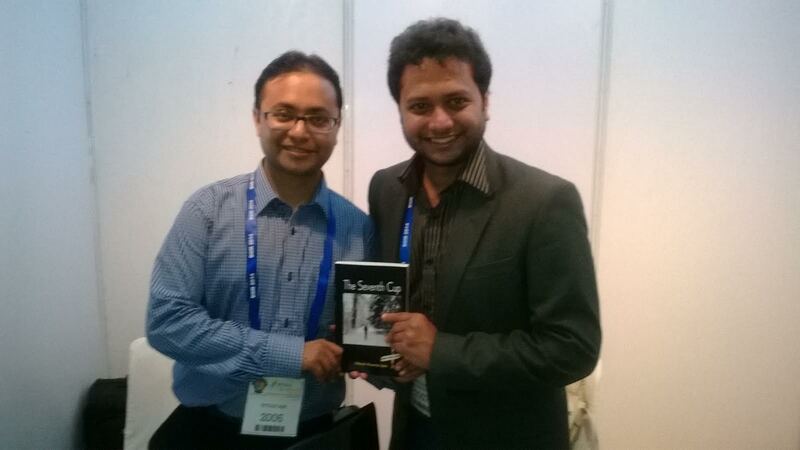 This 3rd Jan weekend in Hyderabad I finally got a chance to meet the author of the bestselling novel The Seventh Cup. Below is an excerpt from our conversation. Nitesh was born in the north-east state of Assam,India. After schooling at Carmel School, Jorhat, he pursued Bachelors in Chemical engineering from BITS Pilani, KK Birla Goa Campus. Later he got post-graduation in Chemical & Bioengineering from ETH Zurich, Switzerland. During his stay in Switzerland he spun the story The Seventh Cup. This is your debut in the writing field, how did you get here? I never planned to publish a novel, while in ETH I started documenting my life in Switzerland & the past experiences in BITS. I shared this with my friends and family & they liked it, it was they who suggested to spin this into a story. It was their idea to create characters & narrate my story through them. So this story is a real life incident & the characters are people from daily life around you? Yes & No. The final story is not a real life incident, rather it has been inspired from incidents in real life. This is a work of fiction with some base in reality, like some characters are directly picked from my friend circle & some are imaginary. The places where this story is unfolds are from life experiences, like Goa where I did my BE & also Switzerland where I accomplished my Masters. What genre does this fall in? This is primarily a mystery & thriller work but it also has a lot of philosophy & life concepts. What was your inspiration in this journey? The Secret by Rhonda Byrne, that has been my inspiration & I am a firm believer of the ideology. Even in my story there are multiple references to this ideology. How difficult or easy was it to get a book published ? Actually there are multiple bands of publishers in the market, the known brands take quite a lot of time to review the work & also are expensive. Not only that there are also different packages available to kind of publishing needed with-respect-to quantity, quality, time & cost. I did not have the time to wait nor the money. I went with Cyberwit.net & I am grateful to them for the excellent job they have done. The next logical step, are you coming up with another story? Well as I first mentioned I never thought of publishing a book, it happened. For now I am working to get the book to the readers & it is keeping me damn busy. For the next story, in the future maybe! Where can the readers find this book? Currently it is available in online-stores Amazon, infibeam, flipkart, I am working to get this book in stores across the country. All the very best Nitesh for a grand success of this, it already is a bestseller & also for future endeavours.